Self-care during grief can help you suffer less in mind, body and spirit. Just doing one of them can start the ball rolling, so don’t feel like you need to do all 9 at once. The list is in no particular order, so scan through and pick one or two that feels “doable.” In a few days, try one more. Don’t worry if you backslide from time to time, just do your best! Grief is painful, and though it may seem far-fetched, there is one person capable of offering you comfort 24 hours a day and seven days a week. That person is you. While self-compassion is not a cultural norm, it should be. Self-compassion has tremendous healing power, and even makes us nicer to be around for others. Treat yourself as you would treat a beloved friend, in word, thought and deed. Give yourself space to feel the pain of grief, and also give yourself permission to take a break when you need it. Try This Self-Care Practice: Place one hand on your heart, and the other hand on your cheek. Say to yourself “I care about you. I care about you.” This is a radical act of self-care and kindness! When you are grieving, your risk for illness increases due to stress. And while grief is a natural reaction to loss, and not an illness itself, this is a good time good time to check in with a healthcare professional. This check-up will give you the opportunity to attend to any pre-existing health conditions that the stress of grief could negatively impact. 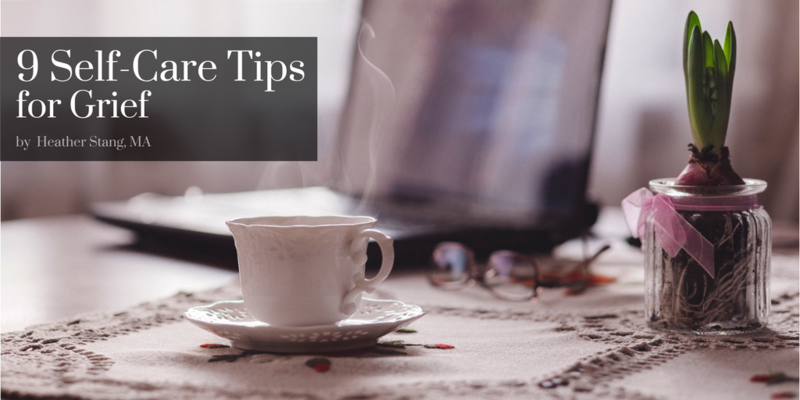 If you are experiencing grief-related insomnia, follow these good sleep hygiene for grief. If you are sleeping more than you did before your loss, know that this, too, is normal, and may be exactly what you need. If too much sleep is impacting you negatively, in addition to practicing good sleep hygiene, increase your exposure to sunlight, particularly upon waking. Try This Self-Care Practice: Read through the Grief & Sleep Tips, and try the guided meditation at the end of the article. This is tough for some of us even when we are not grieving, but now is the time to tend to your body with regular, healthy meals. Drink plenty of water, as it will help your physical and mental state. Avoid alcohol, as it can upset your sleep schedule and depress your mood. Breathing fully and with intention accomplishes two things. First, it turns off the stress response known as fight-flight-freeze. Second, it focuses your mind on the present moment, which can stimulate your mental well-being. Try This Self-Care Practice:Take several one to five minute breaks throughout the day. Close your eyes and take three long breaths—focus on creating a nice, long exhale. Spend the next few minutes just focusing on your natural breath. The right kind of physical movement will help your body release the tension and pain that comes with grief. Whether you take a leisurely stroll outside, practice yoga for grief, or go back to the gym, exercise will contribute to better sleep, mental stability, and an overall sense of well-being. Bonus points if you breathe and drink water while you exercise! Try This Self-Care Practice: Create your yoga practice for grief. One of the most important things you can do for your physical and mental well-being is to connect with other human beings (and animals!) who care about you. Go for a walk with a trusted friend, or schedule lunch with a family member with whom you can share mutual support. Sometimes when we are grieving we feel like our existing support system has fallen apart, so consider joining a peer support group or schedule an appointment with a compassionate grief counselor or therapist who is comfortable talking about grief. You do not need to be a professional writer or artist to benefit from creative expression. Putting your thought and feelings into word and pictures can help you make sense out of seemingly senseless feelings. Write daily in your grief journal, or make a collage to express your grief with magazines and glue sticks. Crafting activities, such as knitting and drawing in adult coloring books, can help you focus and activate the creative side of your brain, which can increase your resilience and contribute to a better sense of well-being. Try This Self-Care Practice: Choose a Grief Journal and then use these grief journal prompts. You can also sign up for a free AfterTalk.com account, where you can write letters to your loved one. There are many forms of meditation to help with grief. This includes contemplative prayer, mindfulness and mantra based meditations, focus and breath practices, guided visualization, walking meditation and yoga (meditation in motion). Meditation helps you take control of your mind and stay in the present, which contributes to your mental well-being. Practice regularly. The frequency with which you practice is more important than the length of your individual session. Start with two to five minutes a day. If you can, work up to 10 to 20 minutes a day. 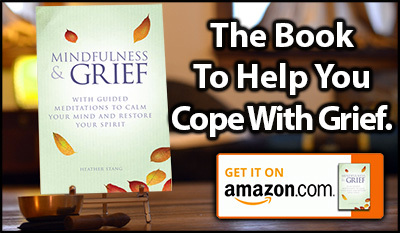 Try This Self-Care Practice: Download or stream these free guided meditations for grief or sign up for the free Mindfulness & Grief Book Bonuses. This self-care list is by no means exhaustive. What do you do to take care of your grieving body? Mind? Spirit? Let me know below!